Ayse Birsel, multi-award-winning designer, decided to try an experiment. She tried to catch herself being creative and reverse engineer exactly what she was doing, and when she’d identified how this design thinking – Deconstruction:Reconstruction, as she calls it – worked, she tried applying it to the most complex, important project of all: her own life. In this conversation, we talk about why design thinking is a great model for business book writing, and indeed for life generally, and why ‘What if…?’ is such a great start for a sentence. Alison Jones: Hello and welcome to the Extraordinary Business Book Club. Today I’m here with Ayse Birsel, who is the co-founder and creative director of Birsel + Seck, the award-winning design and innovation studio. She works with global brands such as GE, IKEA, Toyota, lots more – this is just a short introduction, I didn’t put them all in. She’s the creator of Design the Life You Love, a book and coursework that teaches designers and non-designers how to create a meaningful life using her design process, deconstruction:reconstruction, which is trademarked. And she was identified by Fast Company as one of the world’s most creative people, which must be a huge amount of pressure on anybody. She is the recipient of numerous awards, and her work can be found in the permanent collections of the Museum of Modern Art, Cooper Hewitt National Design Museum, and the Philadelphia Museum of Art. Welcome to the show Ayse. Ayse Birsel: Allison, thank you so much for having me. It’s a pleasure to be talking to you today. Ayse Birsel: Exactly. So, the tea helps and then, I do most of my creative work very early in the morning where, I’m only half awake. So, when you’re half asleep you don’t worry about things like that. You just do some sketching. Alison Jones: That’s so interesting. Julia Cameron says that about Morning Pages. You’re suppose to do them before your conscious mind fully wakes up, and then you can access the creativity. That’s really interesting. Ayse Birsel: That would be the idea. Alison Jones: Now it was Edgar Papke who recommended you as a guest on the show, and I wasn’t aware of your book and which is awful because it’s actually really famous. But he described your book, Design the Life You Love, as a wonderful representation of design thinking in practice, which I thought was a great phrase. So let’s just unpack that a bit. How is design thinking different to regular old thinking, and why does it matter? Ayse Birsel: Great. First of all, thank you Edgar for bringing us together. It’s really a gift to me. So then, about your questions, design thinking in my mind is, thinking like a designer. And what I mean by that is, I’ve realised that we as designers think differently. First of all, we’re optimists. No matter how hard the problem, we think we’re going to come up with a better way to solve it. And that optimism drives our creative energy. We think holistically, we see the big picture, and every project is a learning opportunity. We learn as much as we can, and then try and connect the dots in new ways. We love to work collaboratively, which is great, especially today where the problems have gotten more and more complex. You really need to build your ideas on each other’s ideas. And so the collaboration is a great tool and we’re empathetic. We put ourselves in other people’s shoes, and often we design for others. So this is really key. We need to understand the discomforts, pains, constraints of others, and then the last bit is, we love to ask ‘what if’ questions, and to me that’s all about being open minded because, often the best ideas come from the worst places, and so you need to have that open mind and say, What if? and Why not? Alison Jones: And the way you describe it there sounds more like an approach for happiness in life. Optimism, curiosity, collaboration, empathy. I mean, they’re obviously good problem-solving skills in design, but they’re actually a great recipe for living a good life, aren’t they? Ayse Birsel: It really is. And I think there is, or I’ve found that there is a great natural bond between design and life. And when I started doing Design the Life You Love, it was interesting because people were naturally drawn to it. So, I’ve worked as a designer all my life, and when I would tell people I’m a product designer or an industrial designer, nobody would know what that is. And then I would have to explain it and say, everything you see around you from the table, to the lights, to the cutlery you’re using, all of that is designed by a designer. But then Alison, as soon as I started doing Design the Life You Love, no more questions. People were like, that sounds really interesting. When are you doing your next session? Alison Jones: So they got it even just from the phrase. That’s really interesting. And you always know you’re onto something then, when people just get it, when you say it and they stop and they say, ‘Huh!’, you’ve got a good title. Ayse Birsel: Absolutely. And that’s what, Design the Life You Love started as an experiment. But that interest, that natural interest, people drawing me out and saying, tell me more about it, that’s what kept me going. Ayse Birsel: It’s interesting because, I’ve been pondering that question all my life, and actually one of the reasons that I chose design over art is because I thought, art is really lonely. You have to figure everything out by yourself versus design, you have to collaborate. At the very least you have to collaborate with the manufacturer or the craftsperson. So, and there is logic to it. You can’t just say, because I did this, I felt like doing it, that’s why I did it. You need to explain well, how are you solving the problem and why is it better. Alison Jones: Yes. And no matter how beautiful, if it doesn’t serve the purpose which you designed it, then it’s not good design, right? Ayse Birsel: That’s exactly true. Ayse Birsel: It is really an honour. Ayse Birsel: It’s a big deal. Alison Jones: It’s a huge deal. I’m massively impressed. I’m a little bit intimidated, to be honest, but trying to work through it. Just take us through that deconstruction:reconstruction process, because I thought that was such a … I mean, It sounds neat. It’s got a rhythm and a resonance to it. But tell us what it is firstly, and then take us through … You said you used it as an experiment. How did you morph that from a design tool into a way of designing your life? Ayse Birsel: So Deconstruction:Reconstruction as a design thinking process, really comes from how I think. And I’ve been designing products and product systems all my life. And it was quite an intuitive process. Like, I would open my sketchbook and I would start to draw something, write something, and eventually I was able to leave behind my assumptions and think anew. But at one point I wanted to understand, how do I think? What’s that process? I’ve done it long enough. And so the discovery of Deconstruction:Reconstruction was kind of like a deep dive into my own brain trying to figure out: Where do I start? How do I develop an idea? And how do I conclude it? … It really is this process of, how do you go from what you know today, to what you can imagine for tomorrow. So it has four steps, and deconstruction is taking the whole apart to see what something is made up of. The second step is then, looking at these parts and seeing them differently, and that’s called point of view. And it’s really about shifting your point of view. The third step is reconstruction. Putting it back together knowing you can’t have everything, so what are the essential ingredients of your idea? And then the fourth is expression, giving it form. So, on the foundation of your reconstruction, once you have your ingredients, how are you going to combine them? In what form, for what purpose? And that’s the four-step, step by step process. Alison Jones: Which is beautiful as you express it. How did you realise that it had some … I mean, obviously it came from your thinking I suppose. So it’s almost coming full circle, isn’t it? It was never simply design tool. It was always better understanding how your brain was working. I’d be like, ‘Really? It looks super clear to me.’ And trying to understand, how can I simplify this and simplify it? And I’m still finding that that’s an ongoing process to simplify it and simplify it to a point where, you really get it and it’s very logical, it’s very systematic. But then the magic of creativity still happens. Alison Jones: And when you drew it out, when you said you wrote about it and sketched it, I just want to come back to that for a second, that’s really interesting. Is there a fusion between those two modes for you? When do you write, when do you sketch? How do they work together? Ayse Birsel: That’s a great question. I do both and I usually sketch things, and then I do pull quotes or annotations to explain what I sketched about. And then I learned to write about my ideas from one of my friends, Alan Chochinov who’s today the Chair of Products of Design at the School of Visual Arts where I also teach. But when we were kids, Allan and I went to Pratt Institute together and did our graduate studies together. And I was a great drawer, and Allen was a great writer. And at one point we started collaborating and he taught me that you can actually write about your ideas, and writing about them makes you think things you might not have thought before, or helps you express yourself so that other people who are drawn to writing can understand you. So I find that not only do we think in different ways, some people are, they think in maths equations. Some people think in three dimensions, some people think in writing, some people think in drawing and many others. Some people think in graphs and diagrams and statistics. But also we understand best in those languages. So when you present an idea, not only when you’re thinking through the idea I’m finding, but also when you’re presenting, you need to do it in many different languages as possible, so that as many people as possible understand what you’re talking about because it’s hard to explain new ideas and kind of get a followership. You know what I mean? Alison Jones: Absolutely. And I think you’re right. And I love the way you bring out that dual aspect because I think that is so true, the service it does you, when you very consciously try out different modes. I find if I try and draw something out, it gives me a different perspective and different insights, different ways of understanding it than when I’m writing. And I think to limit yourself to one is, you’re cutting out a whole kind of sphere of understanding. And then you’re right, when you’re presenting it, some people will get it visually. I think most people get visual communication most quickly, honestly. I think that’s the way we’re built. But other people need the, as you say, the math behind it. Other people need to understand how it works spatially and see it put in concrete terms. So all those things that work for communications to other people. I think everybody has those aspects in them as well. And the more you can draw on as you create, the more different perspectives, the richer your understanding of the thing will be. So I think that’s fascinating. Ayse Birsel: Absolutely. And you make me think that, even though we know a picture is worth a thousand words, I find that a lot of people are afraid to draw. And that’s part of the reason that my book is, has images and texts. It’s a visual book, as well as a textbook. And the reason for that is, I find that when you encourage people and remind them, look, you don’t have to draw masterpieces. Just remember how you drew when you were five years old, but try to draw like that, and drawing your ideas is as important as writing about them. Ayse Birsel: And it really unlock something in people, in a whole different dimension. And then they realise, they can draw. Alison Jones: Absolutely. And this is what, it’s funny actually, I’m publishing a book later this year called Draw a Better Business by Cara Holland who’s a graphic facilitator and she’s … And this is exactly, she’s got a beautiful kind of combination of words and pictures working together. But this is her thing she’s like, so many people are put off by the thought that they can’t draw, which is nonsense because this is not about drawing a horse. This is about drawing ideas, and concepts, and the relationships between them, and anybody can do that. Ayse Birsel: Absolutely. That book you just mentioned is so needed. Alison Jones: Absolutely. Well, yes. I know. I’m so excited about it. Brilliant. I want to talk as well about metaphors, which is I think are another fantastic tool for better understanding things, and playfulness, and curiosity and sort of trying to find… Because I love the idea of metaphors, and I think that most people don’t appreciate the power of them. So tell me why metaphors matter to designers particularly ,because I’ve explored the writing angle, but I’m really fascinated to hear more about that design angle. Ayse Birsel: First of all, I love that you love metaphors. They’re one of my favourite creative tools, and you make me think that, Jonathan Haidt who has this wonderful book called, The Happiness Hypothesis, he’s a cognitive psychologist, he talks about metaphors, in terms of metaphors help us understand new or complex things in relation to what we know. And so this is so true in the sense that, if I told you that, my life is like a day on the beach, even if you don’t know my life, you immediately understand that. You have an idea. And so my entry point to metaphors and using metaphors as a designer was in my work with Herman Miller. Jim Long was the director of research at Herman Miller. And he shared with me the… this is years ago when we started working with them together, that was like 20 years ago. He had done research on large corporations like, Coca Cola or GE or GM, really big corporations, where he would go around and ask them, could you describe your organisation in a metaphor? And people would say things like, we’re a beehive, or we are a circus, or we’re like a theatre. And even though you don’t know what these organisations are, like as soon as you hear we’re like a beehive, well, you can think, they must be like incredibly productive, very organised, very disciplined, and they’re producing something as sweet as honey. And that’s the power of metaphors. But then what I like about it is, you can also think, a beehive. There must be no creativity there. Everybody’s working under a queen bee, versus a circus could be this incredibly creative environment, where everybody is holding their talent and skills, practising it, and then are so good that they can perform in front of other people every day. So that’s what I love about metaphors, that they allow you to imagine complex things simply, and also they’re very visual. So, every time I talk about the circus example, I think to myself of a circus and people practising and running around, and all this energy and activity and then I imagine, what a great organisation that must be. Alison Jones: And that’s an interesting point, isn’t it? Because you’re right. When you hear a metaphor it creates a picture in your head, and when you have a picture in your head, then you’re engaging a new part of your brain. You’re engaging your emotions and your imagination, and that creates more impact than an abstract concept. Ayse Birsel: It does and it is also very useful when you want to think differently about things, which to me is the heart of creativity. When you’re being creative, all you’re trying to do is, see the same things differently, and from that, see if you can drive new ideas, solutions and new value. So for example, in my work with Herman Miller, we designed the Resolve office system. And at the beginning, office systems, when we started working on the project, the norm of office systems were cubicles, and I was trying to break out of that idea of an office has to have a cubicle. And it’s really hard in the beginning when there’s so much established preexisting paradigms. How do you get your brain out of thinking about what you know? So the thing that really helped me was, one day I realised that offices are, what we do in offices is perform, and then I thought, well, where else do we perform? We perform in theatres. So then I thought, well what if the office is like theatre, and an office system is a theatre sets, and it’s like for the performance of work. And that completely changed my thinking about what an office system could be. And then the more I worked on it, the more I realised, well, a theatre or a stage set is lightweight, it’s inexpensive, it’s flexible. You can reconfigure it to fit into different performances, and all of those things eventually became strengths of the Resolve office system. And furthermore, it helped me explain my idea to our clients and I said, hey, this is theatre and we’re designing a theatre set. And then we all rallied behind that idea. Alison Jones: Fantastic. And you were describing earlier that, the Deconstruction:Reconstruction process, and that second stage of having deconstructed the thing, looking at the parts anew, and this is a really practical tool for doing that, isn’t it? I mean that, What if…? What if must be just the best start of a sentence ever, isn’t it? If you look at them and you consciously try out different metaphors, and crazy metaphors, but just, what does that, what if it was that. What would that look like? It forces you to look at things in a new way, and then perhaps you can put them together in a new way. Ayse Birsel: Exactly. And so then the idea of applying these tools to your life, in terms of metaphors for example, brings on incredible ideas. So one of my favourite metaphors as a design tool apply to your life is, one day an executive from Colgate Palmolive came to my Design the Life You Love session. And his metaphor for life was, a zen garden. My life is a zen garden. And the way he explained it is, my life is a zen garden and I tend to it every day. Ayse Birsel: So that’s the power of metaphors, and when you apply them through life. Alison Jones: Absolutely. And of course that is going to change your outlook. It’s going to change how you behave, how you feel about each day. Whereas if you had a metaphor where they were hazards in your way, and obstacles that you have to get around then you’d be frustrated. If you’ve conceptualised a zen garden, you’re going to have completely different feeling about them. Ayse Birsel: Exactly. You use the metaphor to draw the hooks and you say, well, a zen garden has these qualities, and then you transfer them to your own life, or to your own product, or to your work. And it helps you, again, make sense of new or complex things in relation to something you know. Alison Jones: I love that. I love the playful quality of it as well and the fact that you can pick metaphors and you can change them, and that’s actually a good thing to do because, there’s nothing like a metaphor taken too far, is there? Can I just ask you as well, because there’s going to be lots of people listening to this, and particularly for people who feel that they are perhaps visual thinkers, design thinkers, what would be your best tip for them, or a first time author listening to the show and wondering how you created that beautiful synergy of text and pictures? Ayse Birsel: Thank you for asking that. Well, couple of things, first of all, my book took me three years. So I would say don’t give up. And it took me three years because, the first draft I did, I thought, well, when you write a book, you have to write it, right? So I wrote it in words, and I still have that draft, and it’s so boring. I haven’t reread it. It’s like… and afterwards I was like, Ayse you’re a visual thinker. You can’t just write. So then the second version was, I tried to write it with a good friend of mine who is an author. And then what I realised is, I’m not an author so maybe I should write it with someone who is an author, but then I couldn’t hear my voice. So then I thought, that doesn’t work because, I really want the person who has the book to feel like they’re in the room with me. And so the third is the charm. The third was, I finally realised it has to be a visual book, because that’s what I am. I’m a visual thinker. All my sessions and presentations are visual. But it’s funny, sometimes it’s really hard to see yourself for who you are. So that’s what took me three years, was to find my voice. And in that, again, talking about collaboration, it was one of my collaborators, Leah Kaplan. We’ve worked together for many, many years. She was the one who pointed out to me, Ayse, you need to make this book visual. And that to me is like, what would be the lesson from that? I would say, when you’re writing the book and if you’re having like me a hard time finding your voice, talk to someone who knows you well, and then, it gets much easier once you find your voice and your style, whether that’s visual, or long sentences or whatever it is. But it has to be you. And then the other thing that I found that really helped me, and I don’t know if this is for everyone, but I wrote the book first and then I pitched it. And that for me made a world of difference. One, the book was complete, so I didn’t have to worry about like, how do I grow from a proposal to the full book. It was like, by the time I pitched it, it was fully baked, and it was then like, you either take this or leave it, but this is the book. And then the thing that made a huge difference for me is, I found my agent, Meg Thompson, and without her I couldn’t have, I don’t think I would have had the book. Because I’ve tried multiple times sending the book to publishers and all I got was, nos. And then a friend of mine recommended that, I talk to this agent, Meg Thompson, and then she saw really an opportunity with the book, and that was the … she’s the one that opened the doors for publishing basically. Alison Jones: Brilliant. And that, I mean there are lots of ways to do this. And it’s interesting when sometimes, it’s better to pitch an idea and have the publisher help shape it with you. But sometimes you just need to do it. You’re right. And it’s quite a short book, isn’t it? I mean it’s got a lot of images. Alison Jones: It’s quite a short book, isn’t it? Alison Jones: No, it’s not a thin book, because it’s got so many illustrations in it. But the actual number of words is relatively low. It’s kind of half words, half illustration. Ayse Birsel: It really is half. And the way I did that is, I would actually start by drawing something, and then the text would be about explaining it. Alison Jones: Exactly. So I think to try and convey that in a proposal would have been really hard. I can see why you needed to do it. And then this is what we’re talking about. It’s quite hard to imagine, trying to describe it to someone. Brilliant. And is there a business book, obviously apart from your own, that you would recommend that people listening to the show should go and read, one that’s particularly struck you? Alison Jones: I might start getting my podcast guests to send me a shelfie. That would be quite good fun. Ayse Birsel: You really should. And some of them are books I’ve read, love of books, some of them are half ways. Some of them, books that I want to read. But one book that I love is, kind of like my go to book is, What Got You Here Won’t Get You There, Marshall Goldsmith. And often I find myself in that situation, like at the, kind of the crux of, where do I go next, and how come, I don’t know everything I want to know to get there. So, I really love that book. Another book is, Whitney Johnson, Build an A-Team. Alison Jones: Yes, I’ve heard of that but I haven’t read it. 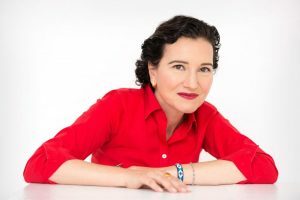 Ayse Birsel: You might have read Disrupt Yourself, which was her previous book, and both actually go kind of hand in hand with Marshall’s book, because Whitney then also tells you how, every five years or so you need to reinvent yourself, and builds on what got you, kind of like, how do you get to the next level. And then, if I may, I also wanted to share, Beth Comstock’s book came out yesterday and it’s called, Imagine it Forward and I just got that in the mail. So now you know my three books. One is, What Got You Here Won’t Get You There. It’s by my bedside. Build an A-Team, understanding how do you get from here to there, and then Imagine it Forward is my to-do reading. Alison Jones: Brilliant. Thank you so much. And if you, would you be bold enough and brave enough to send us a shelfie, because I’ll put that up on the show next so people can see your stack of creativity books. That’ll be hilarious. Ayse Birsel: I will do that. Alison Jones: I think this is going to start to be a thing for the Extraordinary Business Book Club, I think. I love that idea. Brilliant. Ayse, thank you so much. It’s been fun. Alison Jones: That’s right. And you can be as messy as you like. But thank you so much. It’s been such a fascinating conversation at every level. Thank you. If people want to find out more about you and more about Design the Life You Love, where should they go? Ayse Birsel: So Alison, one thing that I just wanted to say is, I want to encourage all your listeners to, design and redesign their life, because, I found that people are extraordinarily creative given a process. And so whether its Deconstruction:Reconstruction or another creative process, I would really recommend everyone to give it a shot, and I’ve done it with people who are as young as 13 and as old or wise I should say as 90 and plus. And so there is no age limit to it, and it doesn’t take a lot of time. It just requires permission to give yourself permission to redesign something. And then our life is our biggest project, so why not? Now having said that, if you’d like to know more about what we do, you can find me on Twitter and that’s, @aysebirselseck, and I’ll just spelled that. A-Y-S-E, Birsel, B like boy, I-R-S-E-L-S-E-C-K, and then you can also find Design the Life You Love by Ayse Birsel on Instagram and Facebook. And then our business website is Birsel + Seck. Alison Jones: Great. I’ll put all those links up on the show notes at the Extraordinary Business Book Club if you happen to be driving or something at the moment, so you’ll be able to go straight through to them. But again, thank you Ayse. It’s been an absolute joy talking to you. Ayse Birsel: It has been for me also, Alison. Thank you so much for inviting me. 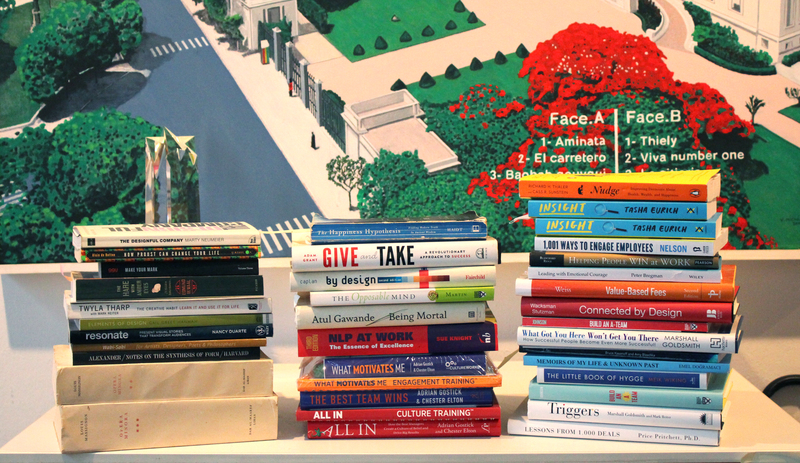 book, collaboration, design, graphic, illustration, publishing, visual, writing. Bookmark.